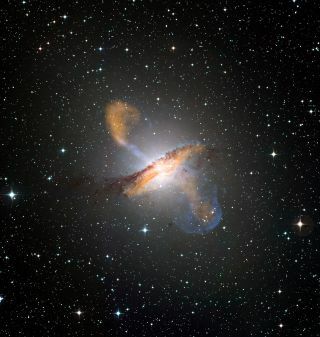 Merging X-ray data (blue) from NASA’s Chandra X-ray Observatory with microwave (orange) and visible images reveals the jets and radio-emitting lobes emanating from Centaurus A's central black hole. Energetic jets spewed forth from a galaxy's supermassive black hole got a close-up in their most detailed image ever taken by Earth radio telescopes. Left: The giant elliptical galaxy NGC 5128 is the radio source known as Centaurus A. Vast radio-emitting lobes extend nearly a million light-years from the galaxy. Right: The radio image from the TANAMI project provides the sharpest-ever view of a supermassive black hole's jets. Astronomers combined the power of nine radio telescopes scattered across Earth's southern hemisphere to take the most detailed image yet of the jets. The team works under the TANAMI (Tracking Active Galactic Nuclei with Austral Milliarcsecond Interferometry) project. Ojha at NASA's Goddard Space Flight Center in Greenbelt, Md. Such data could go a long way toward solving the mystery of the outbound jets, which may change a galaxy's rate of star births by mixing it up with surrounding gas. Astronomers still struggle to pinpoint the jets' role in the formation and evolution of galaxies. But radio waves don't represent the end of the story for the black hole. Much higher-energy radiation in the center of Centaurus A has also shown up in the eyes of NASA's Fermi Gamma-ray Space Telescope. collaborator of Ojha. "With TANAMI, we hope to probe the galaxy's innermost depths to find out."